I made these mini cheesecakes over the weekend and they're delicious. These are the perfect size for a Christmas party! Preheat the oven to 325 degrees. Lightly spray cupcake tins with non-stick cooking spray and set aside. Grind the oreo cookies in a food processor. Add the melted butter and process again until combined. Spoon 1 tablespoon of the cookie mixture into each cupcake cup. Press down. Set aside. Whip the cream cheese in a mixer. Add the melted chocolate until combined. Mix in the eggs. With the mixer on low, stir in the sugar. Combine until there are no lumps. Remember to scrape the sides while you do all of this. Spoon this mixture over the oreo crusts and bake for about 15-20 minutes or until the cheesecakes do not jiggle when you shake the pan. Cool to room temperature before removing from the pans. I found the easiest way to remove them was to run a knife around the edge of each one and then use it to pop them out. Be sure to refrigerate these. Add the candy cane kisses to the top before serving. Warning: these are addicting! They really are so delightful to the eyes...I am sure my palate won't be disappointed either. 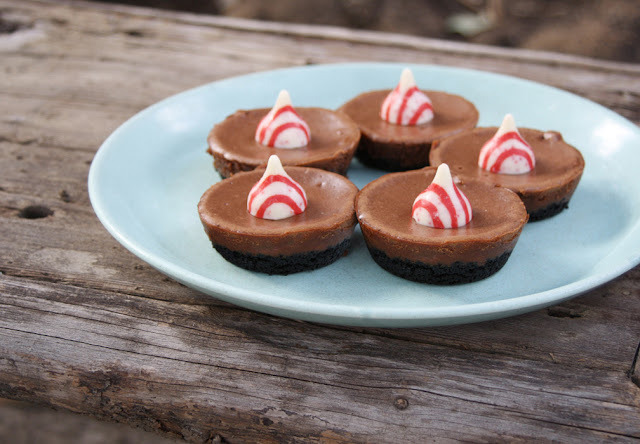 Love the candy cane kisses that give the Christmas feel to the cheesecake treats.This will be a yummy Christmas! These are too cute! I love them :)Including the little kisses on top; those are so good!